Is ADHD a curse or a blessing—or a neurological difference that you can thrive with? Living Well with ADHD accepts the scientific evidence that ADHD can have disabling effects, but it challenges "disability thinking." It is less about coping with disability than using abilities; less about changing your brain than living skillfully with it. Living Well with ADHD presents a different way to think about your difference. It encourages you to take charge of your life. It is not about overcoming a problem, but living mindfully and competently, and making the best of your creative potential. 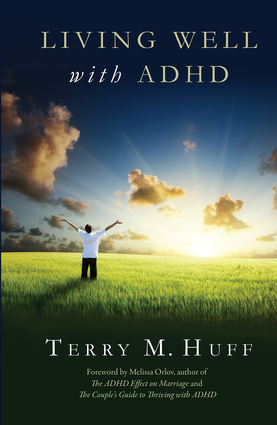 This book is based on the real-world, personal and clinical experiences of author Terry Huff, psychotherapist and founder of an enduring and popular ADHD support group. Terry Huff, MA, MSSW, LCSW is a psychotherapist specializing in the treatment of adults and adolescents with ADHD. He has been providing individual, couple, and family therapy since 1989 in the Nashville, Tennessee area. He is a member of CHADD (Children and adults with ADHD), ADDA (Attention Deficit Disorder Association), NASW (National Association of Social Workers), and a board member of One Dharma Nashville. He has been practicing meditation for more than twenty-five years.